↑ Trucksis, Michele; Michalski, Jane; Deng, Ying Kang; Kaper, James B. (1998-11-24). 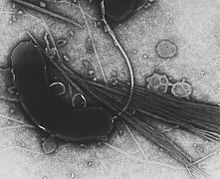 "The Vibrio cholerae genome contains two unique circular chromosomes". Proceedings of the National Academy of Sciences (अंग्रेज़ी में). 95 (24): 14464–14469. PMC 24396. PMID 9826723. आइ॰एस॰एस॰एन॰ 0027-8424. डीओआइ:10.1073/pnas.95.24.14464. ↑ Okada, Kazuhisa; Iida, Tetsuya; Kita-Tsukamoto, Kumiko; Honda, Takeshi (2005-01-15). "Vibrios Commonly Possess Two Chromosomes". Journal of Bacteriology (अंग्रेज़ी में). 187 (2): 752–757. PMC 543535. PMID 15629946. आइ॰एस॰एस॰एन॰ 0021-9193. डीओआइ:10.1128/JB.187.2.752-757.2005. ↑ Ryan KJ; Ray CG, संपा॰ (2004). Sherris Medical Microbiology (4th संस्करण). McGraw Hill. आई॰ऍस॰बी॰ऍन॰ 0-8385-8529-9. ↑ Faruque SM; Nair GB, संपा॰ (2008). Vibrio cholerae: Genomics and Molecular Biology. Caister Academic Press. आई॰ऍस॰बी॰ऍन॰ 978-1-904455-33-2. ↑ Madigan, Michael; Martinko, John, संपा॰ (2005). Brock Biology of Microorganisms (11th संस्करण). Prentice Hall. आई॰ऍस॰बी॰ऍन॰ 0-13-144329-1. ↑ Thompson FL, Gevers D, Thompson CC, Dawyndt P, Naser S, Hoste B, Munn CB, Swings J (2005). "Phylogeny and Molecular Identification of Vibrios on the Basis of Multilocus Sequence Analysis". Applied and Environmental Microbiology. 71 (9): 5107–5115. PMC 1214639. PMID 16151093. डीओआइ:10.1128/AEM.71.9.5107-5115.2005.